The following is a letter I received from Donna Garner. Donna calls Arne Duncan out for using incorrect grammar while criticizing Governor Perry. Donna Garner goes on to explain how our Texas education standards are actually more advanced than Obama's national standards. Then, of course, there is the obvious politicization that is behind Duncan’s statement because Gov. Perry and Texas Commissioner of Education turned down the Obama administration’s “carrot and stick” federal indoctrination initiative entitled Common Core Standards/Race to the Top (CCS/RTTT). 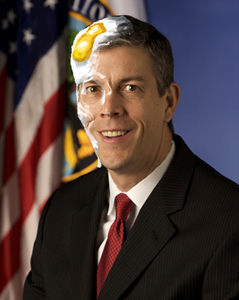 What is so frustrating about Arne Duncan’s comments is that he and the Obama administration’s CCS/RTTT plan will destroy our nation’s youth and any chances they might have to become successful adults and well-educated citizens and voters. The real truth about Texas is that since 1997, our curriculum standards and tests have not been very good; but the large majority of states across the country have not had good standards/tests either. The whole language/holistic writing, multicultural/politically correct, constructivist/project-based, subjective curriculum standards that were pushed into nearly all states over the last fifteen years have harmed the educational level of our entire country by producing ill-prepared public school students. Texas, on the other hand, was one of the first states to recognize the problem; and we began to adopt new curriculum standards in May 2008, starting with English / Language Arts / Reading (ELAR). Praise should go to Gov. Perry who wisely appointed Robert Scott as the new Texas Commissioner of Education and also to the strong leadership of our elected Texas State Board of Education (SBOE) members who adopted the new standards. In the years since 2008, the SBOE has also adopted new Science and Social Studies standards. New Math standards are in the process of development. All of Texas’ new standards are based upon a paradigm shift in educational philosophy from the previous failed one. We believe that all students need to become independent learners whose brains contain large amounts of core knowledge (some of which has to be memorized) before these students can be expected to use that knowledge to expedite their ability to think logically and to analyze/evaluate well (i.e., higher-level thinking skills). Texas’ new curriculum standards (TEKS) are carefully laid out so that the elements are specific for each grade level and increase in depth and complexity as the student progresses from one grade level to the next grade level. At each grade level and/or for each discreet course, all Texas teachers and their students now know what the teacher is to teach and what the student is to learn. Therefore, when the new STAAR/End-of-Course tests are administered for the first time this coming spring, nobody will be surprised or shocked at their content. Because most of the STAAR/EOC test questions will be graded objectively, students, educators, parents, and the public will have more confidence that the test scores are a valid indication of student progress. Texas’ new ELAR standards require teachers to teach and students to learn phonemic awareness, decoding skills, correct spelling, grammar, usage, penmanship including cursive writing, expository/persuasive writing, and research skills. Quality literature and informational texts will be stressed, and these will help increase students’ working vocabulary. The end result will be Texas graduates who are prepared for college and/or careers, and these students will have gained English proficiency and good communication skills. The Common Core Standards (CCS) are not based on any kind of international benchmarks. In fact, the CCS have not even been piloted. The truth is that a hand-picked, politically committed group of people wrote the CCS. The standards were built upon this group’s political philosophy rather than upon sound, empirical research and well-planned pilot programs. What substantive data do these 46 states have to assure them that the CCS will increase students’ academic achievement? None! The official name for the English CCS is “The Common Core State Standards for English Language Arts & Literacy in History/Social Studies, Science, and Technical Subjects.” Even the long, laborious name creates confusion. For simplicity’s sake, I am going to refer to these new standards as CCS/ELAR. The CCS/ELAR go out of their way NOT to emphasize the solid emergent reading skills that the National Institutes of Health/Child Development Division has peer reviewed and replicated in various testing sites throughout the U. S.
The NIH used scientific technology such as cognitive eye instrumentation and MRI’s to demonstrate what occurs in the brains of good readers and poor readers when they are exposed to various types of reading methods. However, the CCS/ELAR writers chose to ignore that research and wrote such broad and generic standards that the door will be opened wide for the discredited whole-language/invented-spelling/holistic-writing crowd to control classroom curriculum. The results of the CCS/ELAR will be an increasing number of children with poor reading, writing, and communication skills. The CCS/ELAR do not require teachers to teach nor students to learn the sounds of each sub-sound of the English language and then learn to map that sub-sound to a letter. For a child to become a good reader, his brain needs to be trained to go from sound-to-letter almost automatically. When that occurs, then his brain is free to consider the meaning of what he is reading; and he develops good reading comprehension. The emphasis in the CCS/ELAR is to push teachers away from teaching the traditional classics that have stood the test of time -- those classics that teach much about our country’s history and origin and that link generations of Americans together. The high-school CCS/ELAR are not even specific for each of the four, capstone English courses -- English I, II, III, and IV. This will create total confusion and lack of direction among English teachers and students in these all-important courses. The CCS/Math do not have designated goals for specific courses such as Algebra I, Geometry, Algebra II (i.e., discreet courses). Instead, the math courses are “blended” together with unclear goals for teachers to teach and students to learn. This is sure to produce students who have math concepts mashed together and who have not learned addition/subtraction/multiplication/division well enough and quickly enough for students to be effective in their higher math and science courses. The CCS/Science that are in the early stages of development do not even expect students to use any kind of analytical mathematics while studying science. The emphasis is on “appreciating” science rather than becoming skilled scientists who have a firm grasp of mathematics. I shudder to think about the horrendous damage that the Obama/Duncan administration will do to CCS/Social Studies. It is in Social Studies that the full force of the social justice agenda will be implemented into children’s lives. NATIONAL ASSESSMENTS One of the worst features of the CCS will be the assessments that accompany them. The CCS will not be aligned with “tests” because generally “tests” contain objectively scored questions. The CCS will be aligned with assessments -- those that are to be taken constantly throughout the year and submitted through the national database to the federal government (i.e., formative assessments) AND those that are to be taken toward the end of the year (i.e., summative assessments) and submitted through the national database. Consider the problems associated with subjective assessments rather than with objective tests that contain right-or-wrong answers. With objective tests, the end score is much more accurate for comparing state-to-state, school-to-school, and student-to-student results. With subjective questions scored by following a rubric, the students are scored based upon the subjective opinions of the evaluator; and opinions differ from person to person. Worse yet, to whom will the parent go to complain if he feels his child’s national assessments have been graded wrong…to the U. S. Department of Education in the insular world of Washington, D.C.? Not only are subjective assessments open to indecisiveness, but they are also much more expensive to score. Are taxpayers going to want to pay higher taxes just so their students’ assessments can be scored in a subjective way? The federal government using our tax dollars will pay for the CCS, but it is going to be up to the states themselves to pay for the expenses incurred with the administration and implementation of the CCS and federally required subjective assessments.